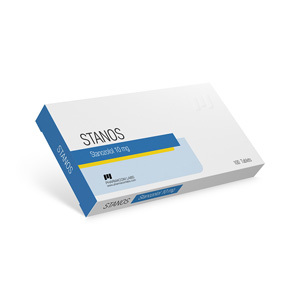 Stanos 10 mg 100tab Pharmacom Lab (stanozolol) is an anabolic tablet product, one of the most sought after in bodybuilding. Used by athletes for the formation of relief and drying of the body. Stanos (stanozolol) has a slight effect on muscle mass, but it has a good effect on the relief and venous appearance of muscles. The drug also burns fat, so it is actively used in courses of drying and normalization of weight. Bodybuilders use Stanozolol in pre-competition training to get the perfect shape. Initially, the drug was used exclusively for medical purposes for the treatment of anemic patients and the recovery of patients after burns and radiation. Attention to its anabolic effect was drawn only in the early 80s. Since then, Stanozolol has consistently been included in all major steroid courses. The drug has a positive effect on the strength and endurance of athletes, so it is also used in athletics and other high-speed sports. Stanozolol removes excess fluid from the tissues and increases the appetite. Along the way, the drug lowers the amount of globulin in the blood that binds testosterone: this quality allows other steroid drugs taken in the combined course to act more actively. Due to the low androgenic index, Stanozolol is successfully used by female athletes.